Super big thanks to community volunteers Lesley, Darren, Lu and Grady for helping us take down the paper hearts from the sakura trees. It's an installation that was not taken down in a timely manner - which is all the Friends ask. If left, in time, all that will remain are the weather beaten dregs. Which kinda loses the 'charm' of any installation. Don't you think? Already the material used to tie the paper hearts were beginning to damage /choke the small branches - trees grow - eventually doing serious damage that can lead to destruction of the tree. The 'Bring Back the Girls' installation was a beautiful gesture, but we waited and waited for them to take it down, to no avail. Sorry, but the time had come. Several of tree adopters of those trees were disappointed too - they shouldn't be expected to take them down. The strings/ribbons and elastic bands used to tie the paper hearts to the branches/tree were a bit of a challenge to remove. Since they'd been up since Spring, they were all tangled and twisted around each and every small branch they were tied to. The only way was to carefully cut them off. It took the five of us about 20 mins. There were over 200 of them. Please, please, please, if you are going to do some rogue art in the park, take it down in a timely fashion, let's say a no more than a month. AND do not tie, tape, nail, attach anything to the trees or do damage to the park. It's just not good for the health of the trees / green space nor is it cool. Think about how it can leave no footprint and how you can take it down easily. We are loosing so many to the emerald ash borer. Does it make sense to lose a tree because of an installation? We want to enjoy both, so make it so ladies and gentlemen. Cheers. Enjoy our awesome park. 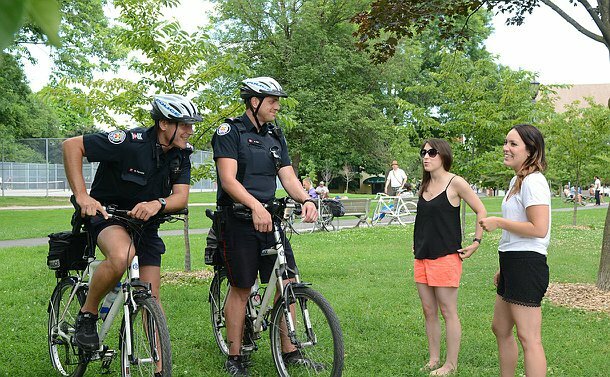 Sian, who's volunteered to be our trusty Chairperson for the next few Friends of Trinity Bellwoods Park General Meetings, is looking for your input in advance of the meeting on July 23rd. Specifically, she's looking for feedback from everyone about the park and its use, ie: what's good, what's a drag -- it's a check-in opportunity. In her walks around the park she's come across caterers who want to help on FoTBP's Park Days, and dog owners who want to hold a fund-raiser for something in the bowl (not a fountain). She's found that all were stunned at how the park has so little financial support from the city with many offering help. She's looking to get the word out that there ways our park neighbors and users can find common ground to help improve the park and the park experience for all of us. Send us your feedback about the park: What's good, what's a drag? And/or come to the meeting! When: Thursday, July 24, 2014 - 7:00p.m. - 9:00p.m. FoTBP is pleased to co-sponsor this tree tour in our park led by the knowledgeable folks at LEAF. How can we make better use of our urban wood? Join us on this tour to hear from local arborists and woodworkers who are trying to do just that! You’ll hear the story of one big maple tree that fell during the ice storm, and see how it’s been transformed into a live edge bench by a local woodworker. Plus, you’ll learn how pests like the Emerald Ash Borer impact our urban forest – and what this means for woodworkers. FoTBP's own Adopt-A-Tree Coordinator, Laura Jamer, is co-leading the tour and will speak about the program. Andrew Baughn, Eco Tree Co. Finally, some multi-use path improvements! South end of park, near Gorevale and Queen. Yes, and the path leading to the alley will have a dip, so anyone on wheels, this will be a welcome additon. Be patient, it won't take them too long. It's gonna be great. NOTE: any path in a park is 'multi-use' which means, to be shared by all - with respect. They are NOT dedicated to any one mode of mobility.